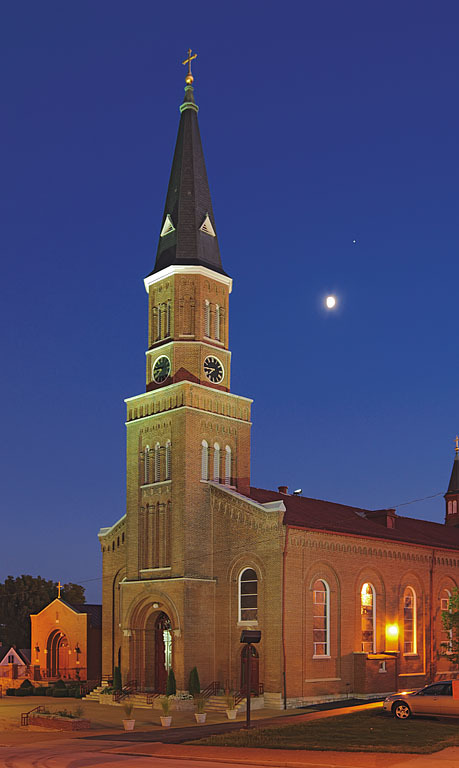 MEET ME this weekend at Saint Peter's Church, in Saint Charles, Missouri, where I will be signing copies of Catholic St. Louis: A Pictorial History. Cost of the book is $32.95 plus sales tax, and I will accept cash or check. I can only accept credit card orders off of this website: check the link to the right on this page. Click here for some of my photos of this church. The parish was started in 1850, and the current church building dates from 1861, and is quite beautiful. The church is located on First Capitol Drive, just a block up from Main Street, which has historic buildings from the 18th and 19th centuries. This is a fine tourist area, with many curio shops, restaurants, and a Lewis and Clark museum: it is well worth a visit. I will be autographing copies of the book after each Mass: Mass times are Saturday, 5:00 p.m.; Sunday, 6:30 a.m., 8:00 a.m., 9:45 a.m., and 11:30 a.m. I will be at a table in the church's annex.